Can climate models embolden the imagination enough to push us through political stalemates? We are getting reports that the COP talks are in disarray. Many experts hedged before the conference and foresaw far less progress on the treaty than we need, and it seems like the outcome will in fact be disappointing. But who knows for sure? Backroom deals could be forged and surprise us all. Visiting Copenhagen, Secretary Clinton just alluded to the U.S. staking the kind of financial commitment that would be the keystone to an ambitious deal in Copenhagen. REDD might be launched in earnest (it is unclear whether a deal is nearly completed or faltering due to a lack of up-front cash from the developed nations), no insignificant thing given that deforestation and degradation, along with changes in soil characteristics, account for 17-20% of global greenhouse gas emissions and many other cascading losses to ecosystem services. As ministers and heads of state arrive at the Bella Center to drafts of choppy, diluted text, many of us outside of the sessions—especially, I’m guessing, all the NGO observers left out in the cold, unmoving lines after some impressive mismanagement on the part of the conference organizers—return to questioning whether high-level collective action is possible on a problem that is not yet immediate (though many claim otherwise) and whose effects will be disproportionately felt among the global poor. It is no mystery that most of us don’t perceive the climate problem as an immediate one that touches our personal lives—that’s because in many circumstances, it is not. I pay relatively little to fill my oil tank, which I need to do because, yes, it still gets cold in winter (the north wind blew right through me on the Eastern Prom in Portland, Maine this morning! ), and a relatively small rise in temperature will not affect my ability to secure water or food: my income is sufficient to buy water and food, and I assume it will be sufficient in years to come even if water becomes more expensive due to scarcity and food prices skyrocket due to global changes in agricultural production and increased demand from a much larger population (but let’s try to remember that there are many out there who rely on staple crops to feed their families and who don’t have disposable incomes to purchase food during shortages; and about the rapidly growing urban populations who need jobs and income to purchase food). Throw in rigorous (ahem!) and pervasive “contrarian” arguments like Hannity’s, “It’s snowing in Houston,” some faith in our ability to engineer our way out of trouble when real trouble actually manifests—a faith fed in many cases, again, by cautious skepticism of model projections—and the need for sizeable up-front costs on the part of the developed world, and we’re left with a very shaky foundation on which to build a meaningful international treaty. At COP, we are banking on some serious cooperative efforts to mitigate greenhouse gases so that a problem illustrated in model projections will not occur. If we do act decisively, later everyone will ask, “Was it really going to happen, anyway?” And we’ll respond that the models said so and, well, at least we modernized our economies, created millions of jobs, and now produce energy from renewable sources – at home. If we do not act decisively, Homo sapiens, “thinking man”, might have some serious regrets. I lifted the Homo sapiens bit from a photographer who I saw speak at the Bella Center about communicating climate change. Mattias Klum is a Swedish freelance photographer who has been all over the world to document some of the most pristine natural environments left on earth, as well as some of our most pressing environmental and humanitarian problems (see here and here). Mr. Klum says that by juxtaposing the two worlds, he can bring the mind closer to the heart – i.e. he tries to bring into the consciousness of a policymaker the likely impacts of environmental change, including climate change. 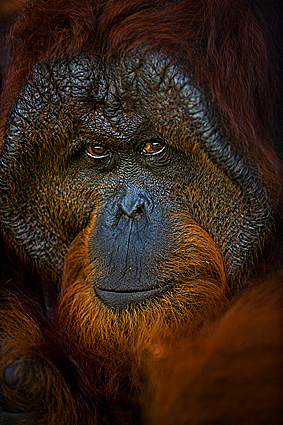 He spoke of using images of ambassador species, such as the orangutan below, to communicate the interdependence of different variables across different levels of ecological systems. He spoke of the widespread misconception among politicians that nature is a luxury. On the contrary, he explained, we are a part of nature, integral to it and sustained by all the ecosystem services provided by it. Extinctions, he claims, are “tips of icebergs” that give us glimpses into how ecological systems are out of balance. Looking at a flower, we can see the sunshine, the soil, the bees, and the farmer who planted the flower, the clouds which produce the rain…We see the whole cosmos which makes it possible for the flower to be a beautiful flower in order for us to enjoy her presence and freshness; just as looking at our body, we can see a forest and everything which supports our human existence, for without them, we will cease to be. In short, Mr. Klum explained that we don’t have time to get the communications wrong—as Olivia Judson wrote recently in the International Herald Tribune (the digital version isn’t up yet), the Earth will be fine in the long-run, but it is uncertain that humanity will endure, at least not gracefully, a series of irreversible changes in vital earth systems. Mr. Klum claims that while he is a treehugger, he is not a sentimental fool. He acknowledges that we are nearing seven billion and growing fast, especially in the developing world, and that we need to use resources. But that is no excuse for being stupid about how we use resources—hence, the “thinking man” comment. For example, the REDD initiative, if executed well, can address deforestation, global and local climate changes, water stress, food security, and biodiversity loss all at once. Surely, REDD would be considered a bargain if all such non-market goods and services were incorporated into a comprehensive benefit-cost analysis, and if that analysis was taken seriously. But such aren’t taken seriously if influential people aren’t passionate about them. A politician can contact the most knowledgeable scientists about a problem, but often understanding isn’t enough to inspire action—feeling is needed, as well. And Mr. Klum hopes that at the very least he can inspire some passion, which will naturally lead to action. He commented that in our busy world, we are hesitant to get into “all that crap” about feelings—what some might call the “fluffy” stuff. But we need to. He recalled the story of James Inhofe jumping on the sea turtle protection bandwagon after being emotionally moved by seeing them on a diving vacation. James Inhofe. Him. In the end, these kinds of agreements are forged by those who act as representatives to the rest of us. It’s important to ask continually just how represented we are. As I mentioned earlier, after the first week at COP, NGO access was severely and hurriedly restricted. People stood in lines for ten hours on Monday, without heat or access to nearby restrooms, many to be turned away late in the day when registration closed. We heard stories of representatives of indigenous groups in tears because they weren’t able to play the role they were sent to play—think of the Inuit affected by melting of sea ice, people from the Andean mountains whose staple crops are vulnerable to small changes in temperature, those in the Amazon displaced by deforestation and soy and cattle production, and Pacific Islanders who will continue to endure flooding and storms from sea level rise and more violent weather events. To the same point, I wonder what good is brought to these fairly exclusive negotiations by a bigillion NGO representatives running around like mad. Presumably they produce an atmosphere of urgency that might influence the negotiations and, like Mr. Klum’s photos, help to remind high level officials of their duties as representatives to the world, help connect minds to hearts.